Apartment 4 people, 3 rd floor with elevator, surface 35m², two bedrooms, balcony, east exposure with mountain views. Stay equipped with a television with fixed sofa and opened kitchen. Fully equipped kitchen: oven, induction hob (3feux), large fridge, washing machine, dishwasher and small appliances (raclette, fondue, waffle, chopper ...) A room with a bed 140 and TV / DVD player. A room with two beds in 90 modular and a drawer bed, with TV / DVD Bathroom with toilet. Parking space indoor residence No Bear. Ski cellar in the basement. Tourist tax: 0.90 € / day / pers.de over 18 years old. The residence &quot;les Thermes&quot; is located in the center of Cauterets 10 m from all amenities, restaurants, shops, ski hire and 200 m from the pool, cinema and Esplanade des Eggs. Ideal not to use your car. 350m from the gondola that takes you to the slopes of the Cirque du Lys, it enjoys a &quot;everything on foot&quot;. Optional service and at preferential rates: sheets, towels, WiFi box, cot, high chair, Pass 2h bath rock. Apartment 4 people, 3 rd floor with elevator, surface 35m², two bedrooms, balcony, east exposure with mountain views. Stay equipped with a television with fixed sofa and opened kitchen. 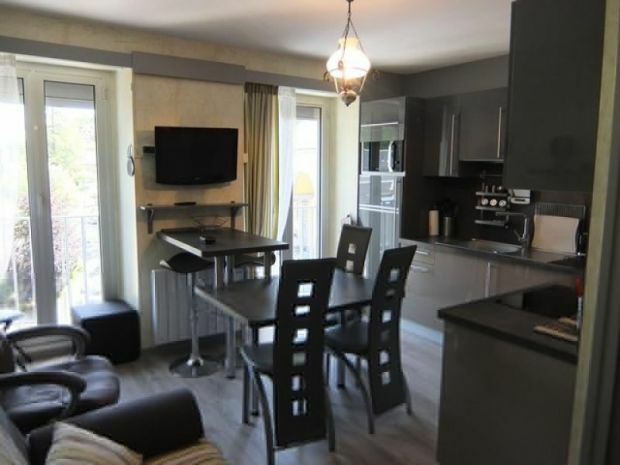 Fully equipped kitchen: oven, induction hob (3feux), large fridge, washing machine, dishwasher and small appliances (raclette, fondue, waffle iron, chopper ...) A room with a bed 140 and TV / DVD player. A room with two beds in 90 modular and a drawer bed, with TV / DVD Bathroom with toilet. Parking space indoor residence No Bear. Ski cellar in the basement. Tourist tax: 0.90 € / day / pers.de over 18 years old. The residence &quot;les thermes&quot; is located in the center of Cauterete, 10m from all amenities, 50m from the spa César, 200m from the Esplanade des Œufs, carousel, cinema, mini-golf and many hiking or from the shuttle to the Pont d&#39;Espagne. Service optional and at preferential rates: sheets, towels, WiFi box, cot, high chair, Pass 2h at Bain du Rocher. Très bon accueil à l’agence mais également dans les commerces... une station où il fait bon vivre ! Le logement est parfaitement situé, au cœur du village. L’aménagement est juste parfait, il possède tout... comme à la maison !